The Gazelle Edge 5 Functions Elliptical Trainer is our best elliptical trainer, which is not overly difficult to setup and to use and it is a good exercise glider that you can be able to use at home. It is great for burning calories whenever you feel that you want to stay fit or build muscles and it is great for your needs of cardiovascular exercises. Our step-up pick is the Universal E40 Elliptical Trainer with LCD and its magnetic resistance can be up to 8 levels so you can adjust and put less stress on your joints as well. It can go for months of regular use and its intuitive LCD screen easily displays various things for your information, such as your current speed, time spent, total distance and calories burned. The budget pick is the Stamina In-Motion Elliptical Trainer and the elliptical trainer lets you see all your workout stats using the scan function and also displays the strides per minute so you can up the game a little bit if you see that you’re bored with the routine. In addition to that, the non-slip pedals of this elliptical trainer make it very safe to use at all times. An elliptical, sometimes called the elliptical trainer or elliptical machine, is a kind of machine that is mainly used to simulate walking, jogging or uphill climbing. As an indoor machine, it is quite similar to the treadmill, but uses pedaling action much like an indoor bicycle or outdoor bicycle. The main goal of an elliptical machine is to practice on your cycling or running skills and also to help build muscle and / or to lose weight. Elliptical machines are lower impact compared to running on a treadmill and this is why most people who have injuries or can’t do treadmills may prefer an elliptical machine, simply because it is easier to use and also less of an impact to your joints and muscles. It is not just cyclists who can use an elliptical – even those who just want to stay fit, build muscles or get slimmer can use an elliptical. The main focus of an elliptical machine is the lower body workout, but you can also add dumbbells as well as make use of the handles to add intensity to your workout, which makes elliptical machines a good choice for those who need variety, whereas treadmills can’t work your upper body at all. Weight capacity: do know the elliptical trainer’s capacity to hold weight, especially if you’re a pretty heavy person. This will ensure that you don’t break the machine and will also ensure that you are not working too much for the machine if you’re thinner. Heart rate monitor: having an elliptical trainer that has an HR or heart rate monitor is crucial to know whether you’re doing a low, medium or high intensity workout on the machine. Durability: a good elliptical trainer should be one that is highly durable made with a frame that won’t easily rust and is fully fastened together so you’ll stay safe with the machine not breaking apart too easily. Ease of setup: whether you want to use the elliptical trainer for home or gym use, it should be easy to put together so that you’ll spend more time working out and less time rummaging through the user instructions or asking people online. Flywheel resistance: as we mentioned below in the FAQ section, it is important to know the flywheel resistance of the elliptical trainer so that you don’t overwork yourself with a flywheel that is too hard to pedal. 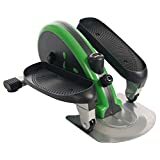 This is very important to know if it is your first time buying an elliptical or if you’re a beginner. Stability and safety: do consider an elliptical trainer that is very stable with nonskid feet so that you don’t compromise on safety overall. 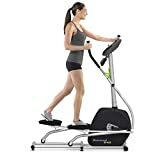 This is important since an elliptical is much more likely to fall over compared to a treadmill so you need to know if the elliptical trainer is safe to use and well balanced. Warranty: elliptical machines have different warranty policies depending on which part is heavily used. For example, most elliptical machines will have 7 to 10 year warranties on the frame and lesser warranty periods for the parts, labor, mechanical and electronic parts. Our best elliptical is the Gazelle Edge 5 Functions Elliptical Trainer which is greatly ideal for almost all fitness levels. This elliptical trainer gives you an immediate feedback so you can stay focused on your target heart rate or intensity and the like. It has a weight capacity of 250 pounds. With non-skid foot platforms to keep you safe, the elliptical trainer helps you to work out without sacrificing your knees. The screen also tracks your current speed, distance and also does time tracking like other elliptical trainers out there. It can be used in the garage as well. It has a good range of motion so you are kept in balance. It has a bunch of foam handlebars to help with comfort. 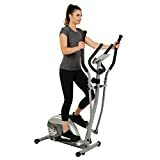 It is more than just walking or running when you work out on this elliptical trainer because its workout computer has 5 functions in total. Made with stability and comfort in mind, the elliptical trainer can go from a slow walk to full run in a matter of minutes so it gets you moving and keeps you challenged. The rolled steel frame is quite durable with a 1.5-inch diameter as well. Great for apartment dwellers, the elliptical trainer helps you to stay fit and in rhythm with no sudden stops at all. It is smooth and quiet in operation and the non-skid foot platforms keeps you safe and sound while working out. The fold up option is good for storage purposes. As an easy to use elliptical trainer, it won’t take up space at all for smaller rooms. This is ideal if you only live in an apartment or a small home and do not have sufficient space to store an elliptical machine. While not a deal breaker, the Gazelle Edge 5 Functions Elliptical Trainer could lack some resistance for some, but you can remedy this by adding bungee cords. It is only an issue that advanced users will find anyway. Our step-up pick is the Universal E40 Elliptical Trainer with LCD, which is battery operated but has an AC adaptor option. It has a total of 7 workout programs and is great for your cardio workout needs. It is a nice and smooth elliptical when it comes down to the pedaling feel. The elliptical trainer only uses four (4) D batteries to function so you can focus on strengthening your core while getting the right information from an affordable home machine. This elliptical trainer also has a heart rate monitor to keep your intensity levels just fine. As a sturdy and reliable machine, this elliptical trainer is great for toning your arms and is a good low-impact training option indoors. It is an easy to use machine and can also connect an MP3 player for music to keep you focused. It also has some pre-programmed modes for you to select. You can go for increasing your heart rate with the monitor of this elliptical trainer to maintain your fitness level at the right track. You can also monitor your calorie burn with this elliptical trainer so it is a great time-saving workout machine to have. It is backed by a warranty of 3 years (frame), 1 year (electronics and mechanical parts) and 60 days (wear items). 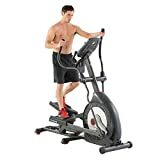 The Stamina In-Motion Elliptical Trainer is our budget pick for an elliptical trainer and it easily tracks workout time for you to stay focused. It is a great workout machine for your legs and glutes and can also help you tone your lower body in an easy way. You can use this elliptical trainer at home or at the office or whenever you feel like working out. It is easy on your joints and also displays the total strides you have done on an entire session. It is compact and lightweight in its design and the textured pedals keep you slip-free and accident-free. There are different ways to exercise on it, making the elliptical trainer very versatile. It also displays the calories burned to keep you motivated. Moreover, the resistance is quiet so it is okay for apartments and dorm rooms. It has an adjustable tension as well and is great for a low-impact workout need. With an electronic fitness monitor to help you keep on track, you can also use this elliptical trainer while watching television or listening to music with no risk of injury at all. You can easily control your workout intensity level with this elliptical trainer and its settings. It can be stored in a closet or right under your desk when not in use. With its sturdy steel construction that can last a long time, you can use the elliptical trainer to train while reading a book. In addition, like all elliptical trainers, you can use the foot pedals to go forward or reverse for a variety in workouts. The EFITMENT E005 Compact Magnetic Elliptical Machine can take up to 220 lbs and is great for cardiovascular endurance. It is a compact machine with a small footprint design for small homes and its non-slip foot plates are oversized and are textured for safety. You can also pedal backwards on it while it has a compact 11-inch stride length. Great for respiratory endurance, it has a belt driven flywheel so it’s quiet to use. You can easily store it away because it is a space saver in its design. With the easy to read digital display monitor (LCD), you can tweak the settings easier and use the 8 level magnetic resistance knob to your advantage. Perfect for small rooms, it has transport wheels so you can go from room to room. It even has a smartphone / tablet holder and helps you achieve the benefits of running. It has hand pulse sensors for heart rate monitoring and is great for apartments. As a portable machine for upper and lower body workouts, other than the casing, everything is made of metal for durability purposes. Great for fat burning while in the comfort of your home, it gives you a total body workout and a scan mode to display all stats. It also displays time and speed and can be easy to move around. It is also safer on the knees for a workout. The Exerpeutic GOLD Elliptical Exercise Dual Trainer has wheels to move it around while the operation is smooth. With an intuitive LCD screen display as well as a backward stride capability, it has a quiet reinforced crank system and a weight capacity of up to 250 lbs. You can also perform an upper body workout with the arms or handles. You can maximize your workout as you can see the time, distance, speed and calories burned displayed. It gives you a natural elliptical motion and its leg stabilizers are extended and are adjustable to keep you safe in the machine. This elliptical accommodates nearly all users and it has reduced foot slippage due to the ribbed dot design incorporated on the larger pedal construction. With this machine, two AA batteries are all you need. It also has a bunch of dual action workout arms for more intensity and has a 1 year limited warranty to back it up. 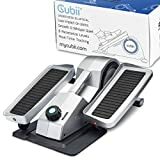 The Cubii Under Desk Elliptical Bluetooth Enabled allows you to exercise while you work in the office as it is easy to put together and burns up to 150 calories per hour. It can easily fit under your desk and has 8 levels of resistance while being whisper quiet not to disturb others. You can also compete with friends using the mobile app and its range of motion is lower for less impact for the knees. Being an ergonomically designed trainer to use anywhere and anytime, you can keep active lifestyle even when on a desk job and set goals for yourself. It gives you an optimal posture with its active sitting training for your leg movement. It only requires 2 to 3 inches between your knees and the desk and you can even share progress with the mobile app because it can be connected via Bluetooth. In fact, even those with wheeled chairs can use this elliptical for improved productivity during the day. It also allows you to adjust the intensity level for different needs and track exercise progress. The Schwinn MY17 470 Elliptical Training Machine has an intuitive LCD screen and supports up to 300 lbs of weight so you can exercise at the comfort of your home. Its headphone jack for listening to music while working out is also effective while it has many programs and goal tracking as well. You can see the time and distance on the LCD while it remains very quiet for getting that killer workout that will match your fitness level. Its Bluetooth connectivity for smartphones is also great for listening to music. The motorized incline helps you to challenge yourself. With its sealed acoustic chamber speakers for music, you can listen to music while being challenged to up to 25 levels of resistance. It is beneficial your whole body training needs due to the included static handlebars so you can meet your calorie goals. Offering a wide range of workouts, it can charge your phone as well due to the USB port as well. Its included fan has 3 speeds and is adjustable to keep you cool and keep you motivated. With various intensity options and less stress on your joints, it gives you a 20-inch stride, With a total of 4 custom profile settings, you also get a warranty of 10 years (frame), 2 years (mechanical), 1 year (electrical), and 90 days (labor / workmanship). The Octane Fitness xR4ci Seated Elliptical Trainer helps you to go for your own interval training needs and its HeartLogic Intelligence feature is there to give you training advice. Great for cardio and strength exercises, you can perform chest press or do a forward or reverse pedaling with a natural stride. Being comfortable to use for a leg press, you can enhance your glute muscles and upper body while moving the handlebars for a total-body workout as well as muscle endurance. The seat moves to different angles so you can add it to your workout intensity so you can get greater muscle engagement while at home. 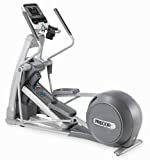 With the Precor EFX 576i Elliptical Fitness Crosstrainer, up to 350 lbs of weight is supported and you get two wheels for smooth moving from room to room. With 3 cross training programs, its included incline ramp can be set from 15 to 40 degrees for a challenge for both upper and lower body workout. It has heart rate monitoring as well as 20 levels of resistance and you can get upper body workout using the movable arms. The length of stride can be set from 21 to 25 inches. Great for glute and quad activity, it is ideal for gym and commercial use. The powder-coating process keeps it rust-free for durability and its accessory holders keep you comfortable. It has a warranty of 7 years (frame), 2 years (parts) and 1 year (labor). With a stride length of 20 inches, the XTERRA Fitness FS5.9e Elliptical Trainer has a forward and reverse option and its screen displays RPM, distance, calories, speed, time, distance and current program. With a Q factor of 2 inches, its handlebars have multiple grip options for better upper body workout. This elliptical is equipped with mp3 player compatibility while its flywheel weighs 25 lbs and gives a fluid motion. You can also monitor your heart rate while it has transport wheels for mobility. It supports up to 400 lbs of weight and has a lifetime warranty (frame and brake), 7 years (parts) and 1 year (labor). 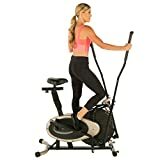 Other elliptical trainers were not fit in our list because they were a hassle to set up, not very good in supporting weights and also had lesser exercise options. The other elliptical trainers were also not very stable because they lacked nonskid feet. Q: What physical benefits can I gain from using an elliptical? The elliptical trainer is great for toning muscles in your body, such as your quads, legs, hamstrings and glutes. In addition to your lower body, you can also tone your upper body if you use the handlebars correctly. The fact that the elliptical trainer is a great thing to have either on a gym or in your room is mainly because of its benefits on your muscles to have a lean body and youthful appearance. Strength and endurance can be trained well on an elliptical, which is important not just for athletes and those who want to build muscles, but also for those who want to stay fit and reduce the risk of obesity later in life. If you often get tired when running or during other workouts then you can build up strength and endurance with the use of the elliptical trainer. Anyone can use an elliptical trainer and set the pace they want. Another great advantage of the elliptical trainer is weight loss, as an exercise that puts you on a situation to burn more calories because you can adjust the workout intensity of the machine. Most people who are going through weight loss journey also go through the elliptical trainer other than just you treadmill as a personal training machine. You can also enhance your cardiovascular health by training on an elliptical machine regularly. It is great for those who want to build heart endurance, especially when they are close to their senior years. Cardiovascular health is important to help protect you against heart diseases and also from getting tired easily after a workout or brisk jog. Q: How does an elliptical trainer compare with a treadmill? Q: What common mistakes am I doing on an elliptical machine and how do I correct them? Most people don’t think their routine through before executing, hence they don’t work out properly. If you just get on an elliptical machine and do a workout on whatever settings you can then that’s just not a challenge at all. To correct this problem, you should set a plan for the day at the gym or at home if you have an elliptical machine there. You should challenge yourself each day, as far as catching your breath, so that your gym membership won’t be put to waste (or your time spent at home won’t be put to waste either). When working on any fitness routine, it should be a challenging thing for you to maximize its benefits. Most people also slouch when they ride on an elliptical machine. Slouching is bad and it will not only lead to a bad posture, but will also lead to potential injury and painful joints and muscles. Like with major exercises, having a bad posture is something we tend to do but we should avoid. Therefore, you should train yourself not to slouch on the elliptical machine when working out. This not only helps you to stay focused but also get the most out of your training on the elliptical machine and to prevent the likelihood of osteoporosis or other joint pains and bad posture problems. You can also strengthen your core with a good posture on the elliptical machine. People also often forget to use the handles. Compared to a treadmill, the elliptical machine has a bunch of handles that are not only user-friendly but also not awkward in design. Therefore, you can definitely use them for your fitness or weight loss programs and to add intensity to your workout. To get the most out of your workout, you can push and pull the handles to also work out your upper body while maintaining a proper posture. If you have trouble with posture then you can definitely get help from the handles of the elliptical machine to get you motivated. People may also tend to repeat their routine and then stay there. The problem with most people is that when they do a routine, they don’t add variation to it. This is why they don’t experience a change in their physical fitness at all because they don’t change their routine. Like we said above, you should always challenge yourself every single day. You can add more intervals between your training, change speed goals and other variables. You can also increase the difficulty of the elliptical in various settings so that you can enhance your physical training day by day. Most people also watch their favorite shows or read e-Books while training. While this is okay and doesn’t put harm to your training, it can actually make your training less effective because you tend to focus more on the plot rather than on your physical form, which will make you tend to slouch. The best way is to just listen to music rather than watch your favorite show because music gets you more focused on training compared to movies or TV shows. Putting a set of earphones or headphones while you do the elliptical is much more convenient because you stay focused and build a rhythm, like you would on popular dance fitness programs. Q: Aside from the treadmill, how does an elliptical machine compare to other cardio exercises and machines? Q: Why should you not put too much pressures when using the elliptical machine? A: The elliptical machine can be tiring if you put a lot of pressure when you use it for longer periods of time. Your toes and entire feet can feel numb if you don’t do it the proper way. The elliptical machine should have a reasonable pressure and speed so that you don’t tire yourself out and cause foot pains. Moreover, you can avoid the numb feeling by putting pressure not just on your toes but also on your heels. In this way, you can avoid having sore feet afterwards that can potentially shorten your elliptical machine workout. Q: Which exercise category does an elliptical trainer fall into? How does that compare with other similar cardio machines? Q: Where can I find an elliptical machine? A: An elliptical machine is usually found at your local gym because of its popularity. Alongside the treadmill, the elliptical machine is very easy to access and you can even buy one for your home or apartment space so you can work out even without having to go to the gym all the time when it’s snowing outside. Take note, however, that like all exercise machines, elliptical machines can be a little pricey since they have mechanical parts and are pretty large. If you do have the necessary budget, you can go for an elliptical machine at home instead of renting one in the gym, so as not to get awkward or insecure with other people. Q: Which mucles of your body are worked out when you go for an elliptical machine workout? Your legs get the best benefits of all when you work out on an elliptical machine, as with all cycling machines. Specifically, you target the quadriceps, hamstrings and gastrocnemius (calves) when you go for an elliptical workout. Quadriceps often benefit the most but if you use the reverse function, you can also go for the hamstrings as well. The up and down motion of your legs can trigger the calves to get stronger. For core and abs workouts, elliptical machines are the best as well. The elliptical machine can also enhance your abdominal muscles if you use it with the correct posture. If you slouch then it won’t tone your core effectively, so proper posture is very important in using an elliptical machine to get the best results possible from it. If you want to tone your glutes (buttocks muscles), elliptical machines are the way to go, as well as other muscles around the hips. Because of the cycling and walking effect that is low impact, you can also tone the muscles on your lower body with the use of an elliptical machine. Upper body muscles and overall strength can be built with the use of the arm handles or poles with the elliptical machine. This includes your arms and other upper body muscles that are in motion when you handle and work on the elliptical machine. Q: Should I only use the elliptical trainer all the time? A: Exercise variety is highly important so you should not rely on the elliptical trainer all the time. You can mix it with some treadmill and rower workouts so that you can help your body build muscle and burn fat easier and more effectively. Different workouts can help you not to have a muscle or body imbalance afterwards or sore joints and muscles with every workout. You should also take breaks when using the elliptical machine. Q: How do elliptical machines help cyclists and runner? A: The elliptical machine is a great way to train if you are a cyclist or a runner or someone competing in triathlons. You get more endurance training and strength training for your hip and glute muscles while not putting stress on your hamstring due to being a low impact activity. Q: Which workout on the elliptical machine is the best depending on my focus? Q: What is the fat burning zone? A: The fat burning zone is a usual feature that most elliptical trainers will display when you use it. However, most trainers suggest that it is not a full measurement or accurate measurement of the actual calories you burned, since it is usually based on fat and not on carbs. The best solution to achieve a real fat burning zone is so upgrade your training regimen and work on the elliptical trainer harder so that you not only burn fat but also burn carbs. In fact, calorie burning can also continue right after you go for a high intensity workout, so it’s okay to go over the “fat burning zone”. Q: What is the flywheel and how do I know what’s the best flywheel weight for my elliptical trainer? Q: Can you add dumbbells to your elliptical training? A: Yes, adding dumbbells can be a great thing for your elliptical training because it can help you work on your upper body while working on your lower body as well. It is a great addition if you want to challenge yourself further while using the elliptical machine. Q: What dashboard information can I see on an elliptical machine? The number of calories burned can help you keep in track on whether you’ve burned quite a lot for the day or for the session. The strides per minute or SPM also helps you to keep in the right form (as mentioned above) so it is a good metric to watch. The heart rate meter can also help you achieve your target heart rate for those who want to keep a good level of intensity for their workout so that you don’t tire yourself too often. Q: Does an elliptical exercise consume a lot of time? A: Not at all, as you can intensify your workout and get only up to 30 minutes on the elliptical machine and you’re good to go! You don’t need to spend 1 hour on the machine, especially if you go for a higher intensity setting, which is helpful for those with day jobs or don’t have a lot of time to work out. Q: What are intervals and why are they important for an elliptical workouts? A: Like most cardio workouts , an elliptical workout should have a bunch of intervals so that you don’t get tired too much. For example, you can put the machine to medium intensity for 2 minutes then follow up with a higher intensity at 1 minute, then go back to medium intensity. This makes it easier to have a steady flow so you don’t wear yourself out with too much intense workouts. Q: Can pilates be done with an elliptical machine? A: Yes, pilates is one of the most popular forms of exercise routines today, and it’s no surprise that you can combine the two to help with glute muscles as well as for losing weight faster and building a good form, especially for bikini season for women. Q: If I’m a beginner on the elliptical trainer, what’s the longest recommended duration that I can use it? A: For beginners with the elliptical trainer, a good duration should be from 10 to 15 minutes and you can increase this up to 30 minutes if you’re getting good at it. Remember that no workout is easy at first, so you need to condition your body with practice, training and repeated exercise so as not to surprise, weaken or injure your muscles and joints, especially on your legs. Q: Who should avoid using the elliptical trainer? People with Achilles tendonitis or similar injuries should avoid using the elliptical to keep them safe and away from further injuries. Moreover, people with stress fractures should avoid the elliptical and switch to a lesser impact exercise or machine. Additionally, people who simply lack the strength or practice for an elliptical trainer can just go for a lesser impact exercise or machine as well. Don’t push yourself if you can’t go through the elliptical trainer just yet and train yourself with lower exercises first. 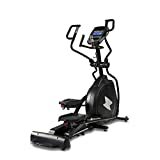 Overall, the Gazelle Edge 5 Functions Elliptical Trainer is our best elliptical trainer which is capable of up to 250 lbs of weight, has 5 functions and non-skid foot platforms for safety. Learned A lot about Elliptical Machine. Thanks!